This article is about the Indian film actor. For other people with the same name, see Salman Khan (disambiguation). Abdul Rashid Salim Salman Khan (pronounced [səlˈmaːn ˈxaːn]; born 27 December 1965) is an Indian film actor, producer, occasional singer and television personality. In a film career spanning over thirty years, Khan has received numerous awards, including two National Film Awards as a film producer, and two Filmfare Awards for acting. He has a significant following in Asia and the Indian diaspora worldwide, and is cited in the media as one of the most commercially successful actors of both world and Indian cinema. According to the Forbes 2018 list of Top-Paid 100 Celebrity Entertainers in world, Khan was the highest ranked Indian with 82nd rank with earnings of $37.7 million. He is also known as the host of the reality show, Bigg Boss since 2010. The eldest son of screenwriter Salim Khan, Khan began his acting career with a supporting role in Biwi Ho To Aisi (1988) and achieved breakthrough with a leading role in Maine Pyar Kiya (1989). Khan went on to establish himself in Bollywood in the 1990s with roles in several top-grossing productions, including the romantic drama Hum Aapke Hain Koun..! (1994), the action thriller Karan Arjun (1995), the comedy Biwi No.1 (1999), and the family drama Hum Saath-Saath Hain (1999). After a brief period of decline in the 2000s, Khan achieved greater stardom in the 2010s by playing the lead role in successful films Dabangg (2010), Ready (2011), Ek Tha Tiger (2012), Kick (2014), Sultan (2016) and Tiger Zinda Hai (2017), all of which rank among the highest-grossing Indian films of all time. He's the only actor to star in the highest-grossing Bollywood films of ten separate years. According to the Forbes 2015 list of Top-Paid 100 Celebrity Entertainers in world, Khan was the highest ranked Indian with 71st rank with earnings of $33.5 million. In addition to his acting career, Khan is a television presenter and promotes humanitarian causes through his charity, Being Human Foundation. Khan's off-screen life is marred by controversy and legal troubles. In 2015 he was convicted of culpable homicide for a negligent driving case in which he ran over five people with his car, killing one, but his conviction was set aside on appeal. On 5 April 2018, Khan was convicted in a blackbuck poaching case and sentenced to five years imprisonment. He is currently out on bail while an appeal is being heard. Khan is the eldest son of screenwriter Salim Khan and his first wife Sushila Charak (who later adopted the name Salma Khan). His paternal ancestors were Alakozai Pashtuns from present-day Swat valley of Pakistan who immigrated to Indore, Madhya Pradesh in the mid 1800s. His grandfather Abdul Rashid Khan was a Deputy Inspector General of the Indore state who was awarded Diler Jung award of the Holkar times. Khan's mother is a Maharashtrian, whose father Baldev Singh Charak, a Dogra Rajput, comes from Jammu-Kashmir and whose mother comes from Maharashtra. Khan's stepmother is Helen, a former actress. He has two brothers, Arbaaz Khan and Sohail Khan; and two sisters, Alvira Khan Agnihotri, who is married to actor/director Atul Agnihotri, and an adopted sister Arpita. Salman finished his schooling at St. Stanislaus High School in Bandra, Mumbai, as did his younger brothers Arbaaz and Sohail. Previously, he studied at The Scindia School, Gwalior for a few years along with his younger brother Arbaaz. He attended St. Xavier's College in Mumbai but dropped out. Khan made his acting debut with the 1988 film Biwi Ho To Aisi, which saw him play a supporting role. He went on to play the leading role in Sooraj R. Barjatya's romantic family drama Maine Pyar Kiya (1989), which become one of the highest-grossing Indian films at the time. It earned him his first nomination for a Best Actor at Filmfare along with a nomination for Best Male Debut at the same ceremony; the latter was awarded to Barjatya. Maine Pyar Kiya was later dubbed in English as When Love Calls, a 125-minute version, which was the biggest hit in the Caribbean market at Guyana and also dominated the box office collections in Trinidad and Tobago. Maine Pyar Kiya had also been dubbed in Spanish as Te Amo, the first experiment of its kind. This 125-minute film also proved its universal appeal with a glorious 10-week premiere run at Lima, capital of Peru. In Telugu as Prema Paavuraalu, it crossed 25 weeks at Visakhapatnam and had a 100-plus day run at six centres in Andhra Pradesh. 1990 saw one film release starring Khan; Baaghi: A Rebel for Love, a box office success, followed by three moderately successful films in 1991, Patthar Ke Phool, Sanam Bewafa, and Kurbaan. The same year, Khan went on to co-star with Sanjay Dutt and Madhuri Dixit for the romantic drama Saajan, which emerged as a critical and commercial success. Despite these early successes, nearly all of his 1992–1993 releases resulted in box office failures. In 1994, Khan appeared in Rajkumar Santoshi's Andaz Apna Apna, co-starring Aamir Khan. At the time of its release, the film failed at the box office but has gained a cult status over the years. He returned to success later in the year with his second collaboration with director Sooraj Barjatya in the romance Hum Aapke Hain Koun..! co-starring Madhuri Dixit. During the 1995 awards season, the film won 3 Filmfare Awards for Best Film, Best Director and Best Actress. It also won the National Award for being the most popular film of the year. Earning over ₹1.35 billion (US$19 million) worldwide, the film became the biggest Bollywood hit of the year. It is one of the films on Box Office India's list of "Biggest Blockbusters Ever in Hindi Cinema". This film turned out to be one of Bollywood's highest-grossing films ever, becoming the fourth-highest earner of all time. The film broke all the previous records and maintained itself as the highest-grossing Bollywood film throughout history for 7 years. In 1995 he starred in Rakesh Roshan's Karan Arjun alongside Shah Rukh Khan, Karan Arjun is an upbeat Bollywood musical, with religious overtones and action. The film was released on 13 January 1995. The two played brothers who are reincarnated after being killed by family enemies. The film was the second biggest hit of the year, and his role of Karan once again put his name among the nominees for the Best Actor award for Filmfare Awards. In 1996, Khan performed in two movies, Sanjay Leela Bhansali's directional debut Khamoshi: The Musical, a box office failure, but critically acclaimed. and Raj Kanwar's action hit Jeet. He had two releases in 1997: Judwaa and Auzaar. The former was a comedy directed by David Dhawan where he played a dual role of twins separated at birth and was a commercial success, while the latter, an action thriller was "below average". Khan worked in five different films in 1998, his first release being the romantic comedy film Pyaar Kiya To Darna Kya opposite Kajol, one of the biggest commercial successes of that year. This was followed by the moderately successful drama Jab Pyaar Kisise Hota Hai where Khan played a young man who has to take a child who claims to be his son, under his custody. Khan's performance in the film earned him several positive notices and favourable reviews from critics. He rounded off the year with an extended cameo in Karan Johar's directorial debut, Kuch Kuch Hota Hai, for which he earned a second Filmfare Award under the Best Supporting Actor category. In 1999, Khan starred in three films: Hum Saath-Saath Hain: We Stand United and Biwi No.1, (the two highest-grossing films that year) and Hum Dil De Chuke Sanam alongside Aishwarya Rai and Ajay Devgan, which earned him another Best Actor nomination at the Filmfare awards. The film was a critical and commercial success along with its music. In 2000, Khan acted in films including Har Dil Jo Pyar Karega and Chori Chori Chupke Chupke, which addressed the issue of surrogate childbirth; Khan played the role of a rich industrialist who hires a surrogate mother after his wife becomes infertile. Critics noted his turn towards a more serious role, which reportedly had more substance in comparison to his previous roles. In 2002 he starred in the delayed release Hum Tumhare Hain Sanam. For Tere Naam, (2003) Taran Adarsh said of him, "Salman Khan is exceptional in a role that fits him to the T. He breathes fire in sequences that demand uneasiness. But beneath the tough exterior lies a vulnerable person and this facet in particular comes to the fore in the latter reels. His emotional outbursts are splendid..." Tere Naam is to date considered Salman Khan's best film with a critically acclaimed performance. He subsequently continued his success at the box office with comedies like Mujhse Shaadi Karogi (2004) and No Entry (2005). Khan's work in 2006 included Jaan-E-Mann and Baabul, however neither of these films were successful at the box office. Khan started 2007 with the ensemble film Salaam E Ishq. His next release Partner performed well at the box office. He next appeared in the Hollywood movie, Marigold: An Adventure in India which told the love story of an Indian man and an American woman. Khan starred in three films throughout 2008, all of which underperformed. Khan hosted the second season of the game show 10 Ka Dum in the year 2009, which turned out to be even more successful than his first season as host in the year 2008. The show got very high TRPs for Sony Entertainment Television and according to reports, the show helped Sony TV regain its third position in the Indian television ratings. 2009 marked a significant turning point in Khan's career. Firstly, Wanted, directed by choreographer turned director Prabhu Deva, became a box office success and earned superhit status. In the same year, he appeared in two other films, Main Aurr Mrs Khanna and London Dreams. London Dreams did average business due to the uninspiring music, but Main Aurr Mrs Khanna was a commercial failure. Khan's first release of 2010 was Anil Sharma's commercially and critically unsuccessful film Veer. His next release, Dabangg was released on Eid, 10 September 2010. Khan played the role of a fearless cop with comic effect in the film. It opened to generally positive reviews and broke several box office records upon release. The film set another box office record, grossing ₹808.7 million in its first week, thus becoming the highest opening week grossing Bollywood film, overtaking the previous record of 3 Idiots. Dabangg went on to gross ₹2.15 billion worldwide. It is the highest-grossing Bollywood film of 2010 and, as of 2012, the fourth highest–grossing Bollywood film of all time. Dabangg went on to win several awards, including the National Film Award for Best Popular Film Providing Wholesome Entertainment. It was later remade in Tamil and Telugu, The film was produced by his brother Arbaaz Khan, and was released on 10 September 2010. It made a record opening at the box office. Dabangg at that time was the second and now the fourth highest-grossing Bollywood film and for his performance, Khan received a Star Screen Award for Best Actor and a Stardust Award for Star of the Year – Male and was nominated for his sixth Filmfare Award for Best Actor. Anupama Chopra from NDTV wrote about his performance: "It's the role of a lifetime and Salman Khan bites into it like a starving man devours a feast. He inhabits it fully, strutting and swaggering and even, spoofing himself." Khan's first release of 2011 was Ready. Upon release, Ready became the second highest opening day grosser, as well as the second highest weekend grossing Bollywood film at that time, after Dabangg. It also held records for being the second highest grossing Bollywood film of 2011. He next appeared in Bodyguard, a remake of the 2010 Malayalam film of the same name. The film was not well received by critics, though it became a financial success, with a domestic total of 1,409.5 million (US$26 million)—India's highest-earning film of the year. Khan with Katrina Kaif at the launch of Ek Tha Tiger's first song 'Mashallah'. Khan's first release of 2012 was Ek Tha Tiger where he starred opposite Katrina Kaif and acted as an Indian Spy. The film garnered positive to mixed reactions from critics whilst opening to extremely strong box office collections. The film went on to break the opening day box office record with a collection of ₹312.3 million (US$4.3 million) and became the second Bollywood film to gross over ₹3 billion (US$42 million) worldwide, behind only 3 Idiots, with an eventual gross of ₹3.1 billion (US$43 million). It marks his first association with Yash Raj Films. The film also broke the records of Opening weekend net gross (First 3 Days of Release), Opening week net gross (First 7 Days of Release) and entered the 100 crore club within just 5 days of release, breaking Khan's own record set by Bodyguard in 7 Days. Khan's second release of 2012 is Dabangg 2, which is the sequel of Dabangg, under the production of Arbaaz Khan. Upon release, the film netted an excellent ₹192.1 million (US$2.7 million) on its opening day and became the biggest opener for a non-holiday Friday in India, beating the previous record held by Don 2, and collected ₹582.6 million (US$8.1 million), beating the previous three-day record set by Ek Tha Tiger. Dabangg 2 eventually emerged as a huge financial success with revenues of ₹2.5 billion (US$35 million) globally. After a one-year gap, Khan's first release of 2014 was Jai Ho which he starred in opposite Daisy Shah. After five consecutive successful films, his next film performed moderately at the box office despite making over 100 crore in India. His second release, Kick, a remake of a Telugu film has entered the Rs. 200 crore club in India on Eid. He also sang the "Hangover" song from the movie. Khan's first film of 2015, Bajrangi Bhaijaan, which was released on Eid, received positive reviews from critics and the public and broke several box office records upon release. The film set an all-time weekend record collecting ₹1.02 billion (US$14 million) on its first weekend at domestic box offices and became Khan's eighth consecutive film to gross over 100 crores. The film, grossing ₹1.84 billion (US$26 million) on its first week beat the previous record of PK. This was Khan's first and the second Bollywood film after PK to enter the 300 club. The film is currently the second highest-grossing Bollywood film in India and worldwide with a collection of over 600 crore. Bajrangi Bhaijaan crossed 300 crore within 20 days of its release and became the second highest grosser to date in India, while his second film, Prem Ratan Dhan Payo, a Diwali release received mixed reviews from critics and the public and broke several box office records upon release. The film became the ninth consecutive film of Salman Khan to gross over 100 crores. The film grossed ₹1.73 billion (US$27 million) on its first week. As of 25 November, the film collected ₹2.01 billion. With this, khan become the only actor to give three back-to-back movies which collected more than ₹200 crore (US$28 million) net domestically. He became the only actor to collect over ₹5 billion (US$70 million) domestic net in a single year in India. Khan's first film of 2016, yet again another Eid release, Sultan, directed by Ali Abbas Zafar for Yash Raj Films received positive reviews from both critics and the public breaking several box office records. The film opened on an average of 70% audience occupancy and grossed approximately ₹36.54 crore (US$5.1 million) on its opening day. The film also collected another ₹74.86 (US$1.00) on its first weekend, bringing its total first week collections to an approximate of ₹208 crore (US$29 million). By the end of its second week, the film had grossed an estimated ₹278 crore (US$39 million) and later became the second film of Khan to net over 300 crores. As of 9 August, the film grossed ₹583.26 crore (US$81 million) worldwide. In June 2017, Khan appeared in Tubelight, his third collaboration with Kabir Khan after Ek Tha Tiger and Bajrangi Bhaijaan. This film also starred Khan's real-life brother Sohail Khan. Despite its high expectations, the film failed to maintain a strong run at the box office. Khan's second release of 2017 Tiger Zinda Hai, a sequel to Ek Tha Tiger grossed ₹190 crore worldwide in its opening weekend. As of 23 January 2018, the film has grossed ₹552 crore (US$77 million) worldwide, including ₹427.67 crore (US$60 million) in India and ₹122.98 crore (US$17 million) overseas. Khan starrer Kick 2 to release on Christmas 2019 After Main Hoon Hero Tera song, Khan is again going to sing a romantic song for Yamla Pagla Deewana 3 with Lulia Vantur. Khan is back in the bay, the actor has begun shooting for his next with Ali Abbas Zafar, Bharat. In 2011, he launched his own production company, called SKBH Productions (Salman Khan Being Human Productions). Money generated from film productions will be donated to the Being Human organisation. The first film made under the banner was the kids' entertainer Chillar Party, which went on to win 3 National Awards for Best Children's film, Best Original Screenplay and Child Artist's Award. SKBH Productions next film will be Shikshanachya Aaicha Gho, a remake directed by Mahesh Manjrekar. In 2014, he launched another production house called SKF (Salman Khan Films). The first film released under this banner was the Canadian film Dr. Cabbie. The film earned $350,452 on its opening day at the box office and Dr. Cabbie became the second highest-grossing film in Canada. The next films under this banner were Hero, in which he also sang the title song "Hero" by Nikhil Advani, which starred Aditya Pancholi's son Suraj Pancholi and Sunil Shetty's daughter Athiya Shetty; and Bajrangi Bhaijaan by Kabir Khan starring Khan himself with Kareena Kapoor & Nawazuddin Siddiqui. In 2008 Khan hosted 10 Ka Dum. The show was extremely popular and was at the number one spot in ratings in India. It garnered an average TVR of 2.81 and a peak rating of 4.5, leaving behind Shahrukh Khan's Kya Aap Paanchvi Paas Se Tej hai? with an average rating of 1.37 TVR and a peak rating of 2.3 and Hrithik Roshan's Junoon — Kuch Kar Dikhane Ka on NDTV Imagine with an average TVR of 0.76 and a peak rating of 1.1. According to reports, the show helped Sony TV regain its third position in the Indian television ratings. He again hosted the show in 2009 and thus won the Best Anchor Award for 10 Ka Dum in 2008 and 2009. In 2010 Khan hosted Bigg Boss 4. The show was widely accepted and appreciated due to Khan's hosting and surpassed the famous hosting of Amitabh Bachchan, According to data available with aMap, a television viewership monitoring agency, the opening episode of Bigg Boss 4 on Colors got a rating of 3.6. Season 3 had average rating of 2.43 while Bigg Boss 1 and Bigg Boss 2 had average ratings of 1.96 and 2.03. While Bigg Boss 1 was anchored by Arshad Warsi, Shilpa Shetty hosted Bigg Boss 2 and Amitabh Bachchan, Bigg Boss 3. The Grand Finale episode on 8 January 2011, received a TRP of 6.7, which was the highest among the finales of other Indian reality shows such as Kaun Banega Crorepati, Rahul Dulhaniya Le Jayega, MasterChef and DID –Li’l Masters. Due to high TRP Khan again hosted Bigg Boss 5 along with Sanjay Dutt in 2011 and because of huge acceptance he also hosted Bigg Boss 6 and Bigg Boss 7 in 2012 and 2013. In 2013 Khan hosted the Star Guild Award for the first time. Khan also hosted Bigg Boss 8, Bigg Boss 9, Bigg Boss 10 and Bigg Boss 11. Khan was associated as a brand when he had advertised for Campa Cola, Limca Soft drink, Hero Honda bikes and Double Bull shirts well before he entered the film Industry. Even after he became a superstar, he never showed interest in promoting himself as a brand, but he was signed for Thums Up in 2002 and continued until its contract was over. Later Akshay Kumar replaced Khan. Later he was the brand ambassador of the soft drink Mountain Dew with whom he ended the contract in December 2010, and now he is once again promoting Thums Up. He has also become the brand ambassador for the travel website, Yatra.com, which also made him a shareholder. He is also the face of the History Channel and the new brand ambassador for Suzuki motorcycles, Previously he endorsed Red Tape Shoes, and now he is endorsing Relaxo Hawaii. Khan is also the brand ambassador of the detergent brand Wheel. 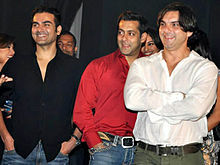 He has also appeared for Chlormint, a brand of gum, with his brother Sohail Khan. The actor has also done a jewellery brand, Sangini with Kareena Kapoor. Apart from innerwear brand Dixcy Scott and tablet BlackBerry Playbook, Britannia' s Tiger biscuits is the latest endorsement of Salman. He is also the face of Ranbaxy' s Revital, replacing Yuvraj Singh. Apart from these brands, he also has Rotomac Pen and SF Sonic Batteries endorsements. Now Khan has been roped in as the brand ambassador of Dubai-based fashion label Splash, and has been also signed as the brand ambassador for Astral Poly Technik Ltd, the leading manufacturers of plumbing and drainage systems in the country. Khan is also the brand ambassador of civic body Bombay Municipal Corporation's (BMC) drive against open defecation in Mumbai, and has been also signed by the Security and Surveillance brand, CP PLUS as their CCTV ambassador. Khan is now the second Ambassador along with Amitabh Bachchan for ‘Emami Healthy & Tasty’, ‘Himani Best Choice’ and ‘Rasoi’, apart from ‘Bake Magic’. Khan has mentored a number of aspiring Bollywood actors. He has also been an inspiration for some Bollywood actors like Hrithik Roshan and Arjun Kapoor to get into perfect shape. Saawan Kumar Tak, the director of Sanam Bewafa, was helped by Khan as he worked Saawan... The Love Season for free. Khan has recommended composers like Himesh Reshammiya and Sajid–Wajid. He supported Sanjay Leela Bhansali to make Khamoshi: The Musical and then Hum Dil De Chuke Sanam. Actor Govinda' s career was rescued by Khan as he was offered a parallel role in Partner. Similarly it was Khan who suggested Mohnish Bahl to Sooraj Barjatya for Maine Pyar Kiya and later in Baaghi: A Rebel for Love after his stint as hero failed. Bahl has also done important roles in Salman's Hum Aapke Hain Koun..!, Hum Saath-Saath Hain and recently Jai Ho. Similarly he was instrumental in getting Ravi Kishan the role in Tere Naam. Salman is now reportedly mentoring Rinzing, son of Danny Denzongpa: Ali, son of Raza Murad and Vaibhav Anand, the son of late Vijay Anand for their Bollywood launches. Similarly Aditya Pancholi’ s son Sooraj Pancholi and Suneil Shetty’ s daughter Athiya Shetty were launched by Salman in his production Hero. He has also decided to offer Sonu Sood his role in the Hindi remake of Mahesh Manjrekar's 2010 hit Marathi movie Shikshanachya Aaicha Gho since he lost many offers due to an injury that happened in the CCL while playing. Salman has decided to mentor his longtime loyal bodyguard Shera's son as well. Armaan Kohli, who had a failed Bollywood career, played a major role with Khan in Sooraj Barjatya' s Prem Ratan Dhan Payo. Khan at his Being Human show with actresses, (l-r) Kareena Kapoor, Rani Mukherjee, Preity Zinta, Katrina Kaif, Karishma Kapoor and Priyanka Chopra. Khan has been involved in several charities during his career. He has started an NGO called Being Human which sells T-shirts and other products online and in stores. A portion of the revenues go to a worthy cause supporting the underprivileged. Being Human Foundation is a registered charitable trust set up by Khan to help the underprivileged. In its early days, Khan set up and funded the Foundation using his own money. The Foundation has two focus areas: education and healthcare. To increase the reach and corpus of the Foundation, Salman Khan has undertaken initiatives such as Being Human Art, Being Human merchandise and Being Human Gitanjali Gold Coins. In 2011, he launched his own production company called SKBH Productions (Salman Khan Being Human Productions). Money which will be generated from film productions will be donated to Being Human. The first film made under the banner was the kids' entertainer Chillar Party, which went on to win 3 National Awards for Best Children's film, Best Original Screenplay and Child Artist's Award. In January 2012, Khan offered to pay ₹4 million (US$56,000) to release about 400 prisoners from about 63 prisons in the state of Uttar Pradesh via his NGO. The prisoners had completed their terms, but due to economic reasons, they were unable to pay legal fines for their charges. In July 2015, Khan offered to donate the profits of his most successful film Bajrangi Bhaijaan among the poor farmers all over India. The film's producers Khan and Rockline Venkatesh both have mutually decided to donate the profits of their film to them. The film's director Kabir Khan and Salman's sister Alvira Agnihotri met Mahrashtra's Revenue Minister Eknath Khadse to discuss the same. Khan met with his 11 year old fan from Pakistan, Abdul Basit who had severe jaundice at the time of his birth; he was diagnosed to have Criggler Najjar Syndrome and was admitted to the Apollo Hospital, Delhi. The youngster wished to meet the “Bajrangi Bhaijaan” star Khan. Khan resides in the Galaxy Apartments, Bandra, Mumbai. He also has a 150-acre plot in Panvel which has 3 bungalows, a swimming pool and a gym. Khan is a dedicated and renowned bodybuilder. Khan never got married. His relationships have been of keen interest to the media and his fans. In 1999, he began dating Bollywood actress Aishwarya Rai; their relationship was often reported in the media until the couple separated in 2001. Khan started dating actress Katrina Kaif. After years of speculations, Kaif admitted in an interview in 2011 that she had been in a serious relationship with Khan for several years, but it ended in 2010. Sangeeta Bijlani and Somy Ali were also in serious relationships with Khan. In August 2011, Khan admitted that he suffers from trigeminal neuralgia, a facial nerve disorder commonly known as the "suicide disease". In an interview, he said that he has been quietly suffering from it for the past seven years, but now the pain has become unbearable. He said that it has even affected his voice, making it much harsher. Khan identifies as both Hindu and Muslim, commenting that, “I’m Hindu and Muslim both. I’m Bharatiya (an Indian)”. He explained, “My father is Muslim and my mother is Hindu”. Salman Khan promoting his production venture Chillar Party. In 2004 Khan was ranked as the 7th Best looking man in the world by People Magazine of the USA. In 2008 his lifelike wax statue was installed in London's Madame Tussauds Museum, and so in 2012, once again another wax statue of him was installed in New York's Madame Tussauds Museum. In 2010 People Magazine, India declared him the Sexiest Man Alive. In 2011, 2012 and 2013 he was declared the Times of India's Most Desirable Man in 2nd, 1st and 3rd place respectively. In August 2013 he was declared India's Most Searched Celebrity Online. Khan topped the Forbes India charts for 2014, in terms of both fame and revenues. According to the Forbes 2015 list 'Celebrity 100 : The World's Top-Paid Entertainers 2015', Khan was the highest ranked Indian in the 71st rank with earnings of $33.5 million. Khan was ranked seventh in Forbes's first global list of highest-paid actors in the world, with earnings of US$33.5 million, which placed him higher than such Hollywood actors as Johnny Depp, Brad Pitt, Leonardo DiCaprio and Dwayne The Rock Johnson. In 2015, he was ranked ahead of US President Barack Obama in the list of The Most Admired Personalities of India. In September 2015, a leading magazine declared him "The Most Attractive Personality" in India. He also became the only actor to collect over ₹5.00 billion (US$70 million) domestic net in a single year in India. Khan was ranked the second "Most Googled Indian of 2015" and first among Bollywood actors. On 24 April 2016 the Indian Olympic Association appointed the actor as the Indian Olympic contingent's goodwill ambassador for the 2016 Summer Olympics. As of August 2017, he is the ninth highest-paid actor in the world, and the second highest-paid in India after Shah Rukh Khan, according to Forbes. On 28 September 2002, Khan was arrested for rash and negligent driving after his car ran into a bakery in Mumbai; one person who was sleeping on the pavement outside the bakery died and three others were injured in the accident. Charges of culpable homicide were laid against him, but later dropped. On 24 July 2013, he was formally charged with culpable homicide in the case, to which he pleaded not guilty. On 6 May 2015, Khan was found guilty of all charges in the case. The Bombay Sessions Court concluded that Khan was driving the car under the influence of alcohol, causing the death of one and serious injury to four homeless persons. Sessions judge DW Deshpande convicted the actor for culpable homicide not amounting to murder and sentenced him to five years in prison. Later in the same day, Khan, being represented by Senior Counsel Amit Desai was granted bail by the Bombay High Court till 8 May 2015, on which the court suspended his prison sentence until the final appeal hearing in July. His driver Ashok Singh, who had given the testimony that it was himself who was driving the car at the time of accident, was charged with perjury for misguiding the Court with false testimony and was arrested. The kidnapping and eventual death of prime witness Police Constable Ravindra Patil remains a mystery, with some suspecting the involvement of organised crime. In December 2015, Khan was acquitted of all charges from this case due to lack of evidence. The Supreme Court on Tuesday 5 July 2016 admitted a plea by the Maharashtra government that challenged the acquittal of Salman Khan in this hit-and-run case by the Bombay High Court. The court refused to fast-track the case. His relationship with actress Aishwarya Rai was a well publicized topic in the Indian media. After their breakup in March 2002, Rai accused him of harassing her. She claimed that Khan had not been able to come to terms with their breakup and was hounding her; her parents lodged a complaint against him. In 2005, news outlets released what was said to be an illicit copy of a mobile phone call recorded in 2001 by the Mumbai police. It appeared to be a call in which he threatened Rai, in an effort to force her to appear at social events held by Mumbai crime figures. The call featured boasts of connections to organised crime and derogatory comments about other actors. However, the alleged tape was tested in the government's Forensic lab in Chandigarh, which concluded that it was fake. The case involves the alleged killing of a deer when Khan and his co-stars — Saif Ali Khan, Sonali Bendre, Neelam and Tabu — were filming the movie Hum Saath-Saath Hain in the forests near Jodhpur in 1998. In 2007, Salman spent a week in Jodhpur jail before the court granted him bail. In addition to the accusations of poaching of endangered antelopes under the Wildlife (Protection) Act, a case under sections 3/25 and 3/27 of the Arms Act was filed against Khan for allegedly keeping and using firearms with an expired licence. On 17 February 2006, Khan was sentenced to one year in prison for hunting Chinkara, an endangered species. The sentence was stayed by a higher court on appeal. On 10 April 2006, Khan was handed a five-year jail term and remanded to Jodhpur jail until 13 April when he was granted bail. On 24 July 2012, Rajasthan High Court finalized charges against Khan and his other colleagues in the endangered blackbuck killing case, paving way for the start of the trial. On 9 July 2014, the Supreme Court issued a notice to Khan on Rajasthan government's plea challenging the High Court order suspending his conviction. Khan was acquitted in the blackbuck and chinkara poaching cases by the Rajasthan High Court on 24 July 2016. On 18 October 2016 the Rajasthan Government decided to approach the Supreme Court to challenge Khan's acquittal in two related cases. On 18 January 2017 Khan was acquitted by a Jodhpur court in an Arms Act case linked to the killing of a blackbuck in Rajasthan. Khan pleaded "not guilty" to charges of violating the law by keeping unlicensed weapons and using them. Acquitting the actor, the court said that the prosecution failed to submit enough evidence against him. On 5 April 2018, Jodhpur court convicted Khan in the blackbuck poaching case and sentenced him to five years imprisonment, while acquitting Saif Ali Khan, Sonali Bendre, Neelam and Tabu. Khan was released on bail on 7 April 2018, pending appeal. On September 2010, Khan was reported to have claimed during an interview on a Pakistani channel that the 26/11 attacks got a lot of attention because the "elite" were targeted. During the interview the actor had said: "It was the elite that was targeted this time. Five star hotels and stuff. So they panicked. Then they got up and spoke about it. My question is "why not before?" Attacks have happened in trains and small towns too, but no one talked about it so much." Khan also said that Pakistan was not to be blamed for it, and that the Indian security forces had failed. Khan's comments had drawn strong reactions from Deputy Chief Minister of Maharashtra Chagan Bhujbal, Shiv Sena, BJP and other political parties. The comments were also condemned by Ujwal Nikam, Special Prosecutor in the 26/11 trial. Khan later apologized for his comments. On 25 July 2015, Khan made a number of tweets from his Twitter account in support of the 1993 Bombay bombings accused Yakub Memon. Memon was scheduled to be executed, before which Khan made his tweets. Khan said that Yakub's brother, Tiger Memon should be hanged instead. He also asked the Prime Minister of Pakistan, Nawaz Sharif to confirm "whether the mob boss is in his country." The tweets sparked protests outside his house where police had to be deployed, and was criticised in the social media and by his father, Salim Khan. Following these incidents, Khan withdrew his tweets and apologised. Khan won numerous awards including two National Film Awards and two Filmfare Awards. ^ a b c "Salman Khan on Bodyguard's success: 'It's no big deal. You can't go mad about these things.'". India Today. 9 September 2011. Retrieved 27 July 2012. ^ "Educational qualification of Salman Khan - Education Today News". Indiatoday.in. Retrieved 23 April 2019. ^ "Salman Khan to Amitabh Bachchan: philanthropic Bollywood". 9 May 2013. ^ "Bollywood wishes Salman Khan on his 46th birthday". DNA India. New Delhi. Press Trust of India. 27 December 2011. Retrieved 27 April 2012. ^ "Salman Khan on dancing in awards shows". 17 July 2017. ^ Lisa Respers France, CNN (6 May 2015). "Who is Salman Khan? One of the world's biggest stars - CNN.com". CNN. Retrieved 19 August 2015. ^ "SALMAN KHAN: Hail Bollywood's new king". Hindustan Times. 28 August 2012. Archived from the original on 26 August 2013. Retrieved 17 January 2013. ^ "rediff.com: Readers' Picks: Top Bollywood Actors". ^ "Top 100 Highest Paid Celebrity Entertainers of World 2018". Forbes. Retrieved 1 November 2018. ^ FPJ Web Desk. "Despite flops, Salman Khan is the richest celeb of 2018 with net worth of Rs 253 crore". The Free Press Journal. Retrieved 5 December 2018. ^ Correspondent, Showbiz (1 September 2014). "Fourth season of Bigg Boss". Emirates 24/7. Archived from the original on 7 September 2014. Retrieved 22 September 2014. ^ "Sultan Is Salman's 10th Film To Enter The 100 Crore Club, While SRK Just Has Six!". 10 July 2016. ^ a b "Salman Khans Prem Ratan Dhan Payo Makes a 200 Cr Hat-Trick – NDTV Movies". NDTVMovies.com. ^ "Top All Time Worldwide Grossers Updated 11/5/2012". Box Office India. Archived from the original on 7 October 2013. Retrieved 11 May 2012. ^ a b "Salman Khan Makes it to Forbes Rich List, Shah Rukh Khan Doesn't – NDTV Movies". NDTVMovies.com. Retrieved 19 August 2015. ^ "Salman Khan does it again – TOI Mobile – The Times of India Mobile Site". ^ "Salman Khan: Bollywood star jailed for five years in hit-and-run case". BBC News. 6 May 2015. Retrieved 6 May 2015. ^ "Salman Khan hit-and-run case: Other high-profile hit-and-run cases". India Today. Retrieved 6 May 2015. ^ Desk, Internet (6 May 2015). "As it happened: Salman Khan sentenced to 5 years in jail in hit-and-run case". The Hindu. Retrieved 6 May 2015. ^ "Hit-and-run: Salman walks free after lower court order quashed". The Indian Express. 11 December 2015. ^ a b "Blackbuck poaching case: Salman Khan gets 5-year jail term". The Economic Times. 5 April 2018. Retrieved 5 April 2018. ^ a b "Bollywood star Khan jailed for five years". BBC News. 5 April 2018. Retrieved 5 April 2018 – via www.bbc.com. ^ Swarup, Shubhangi (29 January 2011). "The Kingdom of Khan". OPEN. Retrieved 17 July 2014. Salim Khan, scriptwriter and father of Salman Khan, remembers the Afghan tribe his family historically belongs to. “It is Alakozai,” he says. “My family came to Indore 150 years ago, and worked as [part of the] cavalry in the time of the British.” Khan is a fifth-generation Khan in India. ^ "Khans in Bollywood: Afghan traces their Pathan roots". Deccan Herald. 17 May 2011. Retrieved 17 July 2014. ^ "Afghan traces Bolly Khans' Pathan roots". Mid Day. 18 May 2011. Retrieved 11 December 2011. ^ Kakaron, Javed Hamim (25 December 2011). "Khans in Bollywood book published". Pajhwok Afghan News. Retrieved 26 February 2012. ^ "Salman celebrates Marathi magic – The Times of India". ^ "Salman Khan to take break from Tiger Zinda Hai shoot for Ganesh festival? ", Deccan Chronicle. Retrieved 2 November 2018. ^ "Salman Khan: We would love to premiere a film in Kashmir, if theatres are re-opened". 18 May 2015. ^ Salman Khan grandfather is from Afghanistan ... Retrieved 1 October 2014. Salman Khan: "My grandfather from Afghanistan... My grandfather from my mother's side comes from Jammu Kashmir..."
^ "Salman celebrates Marathi magic – The Times of India". The Times of India. ^ "Meet 'Prem' aka Salman Khan's family on his 50th birthday". 27 December 2015. ^ "25 things you didn't know about Salman Khan". ^ "Birthday Special: The Rise AND Rise Of Salman Khan". Sukanya Verma. Rediff. Retrieved 27 December 2012. ^ "The Biggest Blockbusters Ever in Hindi Cinema". Box Office India. Archived from the original on 18 September 2010. Retrieved 25 September 2010. ^ "Did Salman Khan Won The Best Debut Filmfare Award 1989". YouTube. Retrieved 24 March 2014. ^ "Top films of Bollywood-Maine Pyar Kiya (1989)". India Today. Retrieved 30 July 2016. ^ "Box Office 1990 Verdict". Box Office India. Archived from the original on 17 October 2013. ^ a b c d "Salman Khan's box office filmography". Box Office India. Archived from the original on 16 November 2007. Retrieved 1 December 2007. ^ "Lawrence Dsouza to remake Saajan?". Mumbai Mirror. Retrieved 5 April 2012. ^ "Saajan Cast & Crew". Bollywood Hungama. ^ "Salman Khan's biggest blockbusters". Biplob Ghosal. Zeenews.com. 18 August 2012. ^ "The Biggest Blockbusters Ever in Hindi Cinema". Box Office India. Archived from the original on 12 October 2012. Retrieved 21 October 2012. ^ "All Time Grossers Inflation Adjusted". Box Office India. Archived from the original on 24 October 2006. Retrieved 28 October 2006. ^ The Nominations – 1995. ^ a b "Box Office 1996". Box Office India. Archived from the original on 24 February 2013. ^ "Khamoshi: The Musical – Cinema". CNN-IBN. Archived from the original on 11 October 2013. ^ "Box Office 1997". Box Office India. Archived from the original on 24 February 2013. ^ "Top Lifetime Grossers 1995–1999 (Figures in Ind Rs)". Box Office India. Archived from the original on 14 October 2013. ^ "Love at first slight". Dhara Kothari. Rediff. ^ "The Winners – 1998". The Times of India. Archived from the original on 8 July 2012. ^ a b "Box Office 1999". Box Office India. Archived from the original on 24 February 2013. ^ "The Nominations – 1999". The Times of India. Archived from the original on 8 July 2012. ^ "A Treat to Watch". Sharmila Taliculam. Rediff. ^ Adarsh, Taran (8 March 2001). "Chori Chori Chupke Chupke: Movie Review". Indiafm.com. Retrieved 25 January 2008. ^ "Review". Sukanya Verma. Rediff. ^ Adarsh, Taran (15 August 2003). "Tere Naam". indiaFM. Retrieved 21 February 2008. ^ Madhureeta Mukherjee (14 August 2003). "Tere Naam is Salman's best act". The Times of India. Retrieved 17 August 2012. ^ Adarsh, Taran (15 August 2012). "TOP 10: Salman Khan's biggest hits". Hindustan Times. Archived from the original on 18 August 2012. Retrieved 15 August 2012. ^ "Box Office Results Top Grosses by Decades and Years – 2007". International Business Overview Standard. Archived from the original on 8 December 2012. Retrieved 1 December 2007. ^ "God Tussi Great Ho". Box Office Mojo. Retrieved 25 September 2010. ^ Lakhvinder Baddhan (25 August 2008). "Sony TV regains numero three position". BizAsia UK. Archived from the original on 19 December 2013. Retrieved 9 January 2008. ^ "Box Office 2009". Box Office India. Archived from the original on 10 May 2012. ^ BOI Trade Network (2 December 2010). "Top Ten All Time Worldwide Grossers". Box office India. Archived from the original on 25 April 2012. Retrieved 21 October 2012. ^ "Dabangg beats 3 Idiots, collects Rs 14 crore on opening day". Hindustan Times. 11 September 2010. Archived from the original on 19 September 2010. Retrieved 25 September 2010. ^ "Dabangg Is 17th All Time Blockbuster". Box Office India. Archived from the original on 24 September 2010. Retrieved 25 September 2010. ^ Chopra, Anupama. "Review: Dabangg". NDTV movies. NDTV. Archived from the original on 14 July 2011. Retrieved 19 August 2012. ^ "Ajay Devgn, Salman Khan, Aamir Khan: The Billion-Dollar club". The Times of India. 5 August 2011. Retrieved 21 October 2012. ^ Abid, Bollywood Trade Editorial (25 June 2011). "Audience is now READY for DOUBLE DHAMAAL!". Bollywoodtrade.com. Retrieved 21 October 2012. ^ "Bodyguard v Dabangg Territory Figures". Box Office India. Archived from the original on 22 July 2013. Retrieved 12 October 2011. ^ "Ek Tha Tiger Movie Reviews". Review Gang. ^ "Ek Tha Tiger Collects 10 Crore in Week Three". Box Office India. Archived from the original on 10 September 2012. Retrieved 7 September 2012. ^ "EK THA TIGER First Day Territorial Breakdown". Box Office India. Archived from the original on 22 July 2013. Retrieved 16 August 2012. ^ "Top Ten All Time Worldwide Grossers". Box Office India. Archived from the original on 21 June 2013. Retrieved 17 January 2013. ^ Gitanjali Roy (16 August 2012). "Ek Tha Tiger collects record-breaking Rs 32 crores on opening day". NDTV movies. NDTV. Archived from the original on 20 August 2012. Retrieved 18 August 2012. ^ "Salman khans ek tha tiger earns 60 crores". Yahoo!. Retrieved 18 August 2012. ^ "Ek Tha Tiger Heads For 30 Crore Second Week". Box Office India. Archived from the original on 29 August 2012. Retrieved 28 August 2012. ^ "Dabangg 2 Second Day Business". Box Office India. Archived from the original on 27 December 2012. Retrieved 23 December 2012. ^ "Dabangg 2 Has Strong Sunday". Archived from the original on 27 December 2012. Retrieved 23 December 2012. ^ "Dabangg 2 Weekend Territorial Breakdown: RECORDS In Many Circuits". Box Office India. Archived from the original on 27 December 2012. Retrieved 26 December 2012. ^ "Dabangg 2 Is Third Film To Hit 250 Crore Worldwide". Box Office India. Archived from the original on 24 February 2013. Retrieved 20 February 2013. ^ "Salman khan starrer Kick enters 100 crore Club in India". Patrika Group (29 July 2014). Archived from the original on 29 July 2014. Retrieved 29 July 2014. ^ "Bajrangi Bhaijaan Sets All Time Weekend Record". 20 July 2015. Archived from the original on 18 October 2015. Retrieved 22 March 2016. ^ "Top India First week All Time". Archived from the original on 18 July 2015. ^ "Salman Khan Enters The 300 Crore Club With Bajrangi Bhaijaan". Koimoi. 6 August 2015. Retrieved 19 August 2015. ^ "Bajrangi Bhaijaan grosses Rs 600 crore worldwide". indicine.com. Retrieved 19 August 2015. ^ "Blockbuster! Salman Khan's 'Bajrangi Bhaijaan' makes Rs 300 cr in India". Zee News. 6 August 2015. Retrieved 19 August 2015. ^ "Salman Khan 'Bajrangi Bhaijaan' becomes the second highest grosser in India after PK". The Indian Express. 6 August 2015. Retrieved 19 August 2015. ^ a b "Prem Ratan Dhan Payo (PRDP) box office collections enable Salman Khan's entry into new Rs 500-crore club at No. 1 spot – The Financial Express". The Financial Express. 23 November 2015. Archived from the original on 24 November 2015. ^ a b "Salman Khan's 'Prem Ratan Dhan Payo, 'Bajrangi Bhaijaan' jointly earn more than Rs. 500 cr". The Indian Express. 24 November 2015. ^ a b "Prem Ratan Dhan Payo, Bajrangi Bhaijaan: Salman Khan is the first Rs 500-crore actor of 2015". ^ a b "Salman Khan is Now Only Actor to Make 500 Cr in a Year For Bollywood". NDTVMovies.com. ^ "Sultan Takes Bumper Opening – New Records Likely". Box Office India. 6 July 2016. Archived from the original on 23 July 2016. Retrieved 1 August 2016. ^ "Box Office: Worldwide Collections and Day wise breakup of Sultan". Bollywood Hungama. 7 July 2016. Retrieved 1 August 2016. ^ "Salman Khan's 'Sultan' beats 'Bajrangi Bhaijaan's' first-week collection". The Times of India. 14 July 2016. Retrieved 1 August 2016. ^ "Sultan Has Very Good Second Week". Box Office India. 22 July 2016. Archived from the original on 23 July 2016. Retrieved 1 August 2016. ^ "'Sultan' box office collection: Salman Khan-starrer crosses Rs. 300 crore mark". International Business Times. 10 August 2016. Retrieved 10 August 2016. ^ "Box Office: Worldwide Collections and Day wise breakup of Sultan". Bollywood Hungama. 7 July 2015. Retrieved 10 August 2016. ^ "Exclusive: It's official! Katrina Kaif opposite Salman Khan in 'Tiger Zinda Hai'". DNA India. 13 September 2016. Retrieved 13 September 2016. ^ "Worldwide Opening Weekends All Time - Tiger 5th". ^ "All Time Worldwide Grossers - Tiger Zinda Hai Sixth". Box Office India. 23 January 2018. ^ "Box Office: Worldwide collections and day wise breakup of Tiger Zinda Hai". Bollywood Hungama. 23 December 2017. Retrieved 21 January 2018. ^ "Box Office: Tiger Zinda Hai grosses 533 crores worldwide". Bollywood Hungama. 13 January 2018. ^ "CONFIRMED! Salman Khan's Kick 2 to release on Christmas 2019". Bollywood Hungama. 7 February 2018. Retrieved 7 February 2018. ^ "WOW! Salman Khan and Iulia Vantur to come TOGETHER for a ROMANTIC song and it is for Yamla Pagla Deewana 3". Bollywood Hungama. 12 June 2018. Retrieved 12 June 2018. ^ "WHOA! Here's the FIRST LOOK of Salman Khan in Ali Abbas Zafar's Bharat". Bollywood Hungama. 24 July 2018. Retrieved 27 July 2018. ^ a b "SKBH Productions to do charity". 10 June 2011. ^ a b "Chillar Party wins 3 National Awards!". The Times of India. 7 March 2012. ^ "Watch: Salman Khan sings 'Main Hoon Hero Tera' in Sooraj, Athiya's 'Hero'". The Indian Express. 6 August 2015. Retrieved 19 August 2015. ^ "Surprise! Salman Khan Releases Hero Song a Day Early on Popular Demand". NDTVMovies.com. ^ "Eros International acquires global distribution rights of Salman Khan's Bajrangi Bhaijaan and Hero". Bollywood Hungama. 8 December 2014. ^ "Salman Khan revs up Sony's TRP ratings with Dus Ka Dum". The Times of India. 10 June 2008. ^ Lakhvinder Baddhan (25 August 2008). "Sony TV regains numero three position". BizAsia UK. Archived from the original on 19 February 2009. Retrieved 9 January 2008. ^ "Salman to host Big Boss 4". The Times of India. Archived from the original on 6 August 2010. Retrieved 10 September 2010. ^ Mukherjee, Sharmistha (7 October 2010). "Bigg Boss 4: Salman Khan scores over Amitabh Bachchan". Business Standard. ^ "Bigg Boss 4 ends on a high note with 6.7 TVR". Indiantelevision.com. 12 January 2011. Retrieved 17 January 2011. ^ "Salman Khan's first ad as a 15-year-old in the '80s just can't be missed!". abplive. 13 July 2016. Retrieved 30 July 2016. ^ "Limca Commercial Salman Khan OLD Doordarshan ads 1985". YouTube. Retrieved 15 January 2015. ^ "The Hero Honda CD100 AD Featuring Salman Khan old AD". team-bhp.com. 23 April 2012. Retrieved 22 November 2012. ^ "Nostalgia: When Salman modeled for Double Bull". bollywoodhungama. 19 February 2013. Retrieved 20 February 2013. ^ "Salman Khan won't endorse Mountain Dew". Hindustan Times. 25 April 2012. Archived from the original on 15 June 2012. Retrieved 27 July 2012. ^ "Salman Khan signed as Thums Up brand ambassador". zeenews.india.com. 7 October 2012. Retrieved 22 November 2012. ^ "Coca-Cola again ropes in Salman Khan to endorse 'Thums Up'". The Economic Times. 7 October 2012. Retrieved 22 November 2012. ^ "No one-time endorsement fee, stars have more at stake now: Salman?s deal with yatra.com is part of a growing trend". Business Standard. 13 April 2012. ^ Our Bureau. "Business Line : Industry & Economy / Marketing : Suzuki Motorcycle to ride on Salman Khan". Business Line. Archived from the original on 25 June 2012. Retrieved 27 July 2012. ^ "Salman Khan to endorse Red Tape Shoes". indiantelevision.com. 27 August 2004. Retrieved 22 November 2012. ^ "Salman Khan to endorse another footwear brand". bollywoodlife.com. 26 July 2012. Retrieved 22 November 2012. 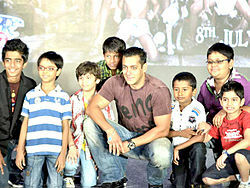 ^ "Salman becomes brand ambassador for Wheel". The Economic Times. 6 March 2012. Retrieved 22 November 2012. ^ "Salman Khan pumps up his brand value". businessofcinema.com. 3 February 2012. Retrieved 22 November 2012. ^ "Salman 'Tiger' Khan to endorse Tiger biscuits". indicine.com. 3 November 2012. Retrieved 28 November 2012. ^ "Salman Khan is the new brand ambassador for Ranbaxy's Revital". businessofcinema.com. 3 November 2012. Retrieved 28 November 2012. ^ "Just how much money is riding on Salman Khan?". Rediff. 26 August 2011. Retrieved 6 December 2012. ^ "Salman Khan to endorse Dubai's Splash". 30 July 2013. Retrieved 30 July 2013. ^ "Salman Khan's new role". The Times of India. 2 August 2014. Retrieved 2 August 2014. ^ "Salman Khan is now BMC's brand ambassador against open defecation". Indian Express. 18 December 2016. Retrieved 18 December 2016. ^ "CP PLUS Signs up Salman Khan as Its CCTV Ambassador". News 18. 20 September 2017. Retrieved 8 December 2017. ^ "Salman Khan and Dangal director Nitesh Tiwari join hands". Bollywood Hungama. 2 January 2018. Retrieved 3 January 2018. ^ "Is Salman Khan the Godfather of Bollywood?". bollywoodlife. 1 March 2013. Retrieved 27 June 2014. ^ "The One-Man Army: Salman Khan". bollywoodhungama. 29 April 2014. Retrieved 27 June 2014. ^ "Sanjay Leela Bhansali breaks silence on his fallout with Salman Khan!". DNA India. 28 December 2015. Retrieved 30 July 2016. ^ "Why these stars won't make it to Salman's friend list". Rediff. 15 December 2010. Retrieved 30 July 2016. ^ "Mohnish Bahl's birthday: When Salman Khan came to Mohnish's rescue". Daily Bhaskar. 14 August 2013. Retrieved 30 July 2016. ^ "Salman Khan introduces debutant star kids Sooraj Pancholi and Athiya Shetty at 'Hero' trailer launch in Mumbai". The Times of India. 17 July 2015. Retrieved 30 July 2016. ^ "Salman turns godfather to 11 wannabe stars in 2014". Hindustan Times. 4 June 2014. Archived from the original on 15 June 2014. Retrieved 27 June 2014. ^ "Armaan Kohli shoots for Salman Khan's 'Prem Ratan Dhan Payo'". Zee News. 13 August 2014. Retrieved 30 July 2016. ^ "Salman still dares to 'bare' at 40". CNN-IBN. 27 December 2005. Archived from the original on 12 October 2007. Retrieved 1 December 2007. ^ Our Bureau. "Business Line : Industry & Economy / Marketing : Salman Khan's NGO Being Human to launch stores by Feb". Business Line. Archived from the original on 11 January 2012. Retrieved 25 December 2011. ^ "The Salman Khan Foundation". 7 December 2011. Archived from the original on 28 April 2012. ^ "Salman Khan to help free 400 prison inmates in Uttar Pradesh". Retrieved 27 January 2012. ^ "Salman Khan's Being Human act; Profits of Bajrangi Bhaijaan to be shared among farmers". pardaphash.com. Archived from the original on 24 July 2015. Retrieved 19 August 2015. ^ "Salman Khan meets fan from Pakistan". The Indian Express [P] Ltd. The Indian Express. 9 December 2015. Retrieved 14 May 2016. ^ "Salman Khan meets 11-year-old Pakistani fan". The Express Tribune. 10 December 2015. Retrieved 14 May 2016. ^ IANS (9 December 2015). "'Bajrangi Bhaijaan': Salman Khan meets fan from Pakistan". Times Internet. The Economic Times. Retrieved 14 May 2016. ^ "Salman Khan meets his little fan from Pakistan". Independent News Service. India TV. 10 December 2015. Retrieved 14 May 2016. ^ "Sweet! Salman Khan meets his 11-year-old Pakistani fan". DAWN. 10 December 2015. Retrieved 14 May 2016. ^ "Salman was my first serious relationship:Katrina Kaif". 7 December 2011. Archived from the original on 7 July 2015. ^ "5 times Salman Khan almost got married!". Archived from the original on 19 July 2014. Retrieved 29 August 2014. ^ "Salman suffering from the suicide disease". 24 August 2011. Archived from the original on 17 August 2013. ^ "I'm Hindu and Muslim both: Salman Khan tells court". financialexpress.com. 28 January 2017. Retrieved 5 April 2018. ^ "I'm both Hindu and Muslim: Salman Khan tells Jodhpur court". Hindustan Times. 29 April 2015. ^ "Salman Khan on number 3". TOI. Retrieved 10 August 2013. ^ "Salman Khan tops India's most searched celeb list online". The Economic Times. 1 August 2013. Retrieved 10 August 2013. ^ "Salman Khan Tops And Beats Shah Rukh Khan". businessofcinema. 13 December 2014. Retrieved 15 December 2014. ^ "Salman, Akshay, Big B in Forbes Top 10 highest-paid actors list, earn more than Johnny Depp". The Indian Express. 5 August 2015. Retrieved 19 August 2015. ^ Natalie Robehmed. "Salman Khan – In Photos: The World's Highest-Paid Actors 2015". Forbes. Retrieved 19 August 2015. ^ "Amitabh Bachchan, Salman Khan, Akshay Kumar among world's top ten highest-paid actors". IBNLive. Retrieved 19 August 2015. ^ "Forbes' highest-paid actors: Amitabh, Salman, Akshay richer than many in Hollywood". India Today. ^ "YouGov – World's most admired 2015: Angelina Jolie and Bill Gates". ^ "Salman Khan beats Shah Rukh Khan and Aamir Khan to become India's most attractive personality [PHOTOS]". International Business Times, India Edition. 16 September 2015. ^ "Sunny Leone, Salman Khan, Katrina Kaif: Most Googled Indians of 2015". The Times of India. ^ "Sunny Leone Most Googled Indian of 2015, Ahead of Salman Khan". NDTVMovies.com. ^ "Sports farternity divided, IOA firm on Salman Khan as goodwill ambassador for Rio". The Indian Express. 25 April 2016. ^ Robehmed, Natalie. "Full List: The World's Highest-Paid Actors And Actresses 2017". forbes.com. Retrieved 5 April 2018. ^ "Salman Khan's jeep runs over pavement dwellers, one dead; actor surrenders". Rediff. 28 September 2002. ^ Ahmed, Zubair (3 September 2003). "Bollywood homicide charge dropped". BBC News South Asia. Retrieved 16 October 2006. ^ "Salman Khan: Bollywood star guilty in hit-and-run case". BBC News. 6 May 2015. ^ "Live: Salman Khan reaches home after HC grants him bail in 2002 hit-and-run case". IBN Live. 6 May 2015. Archived from the original on 9 May 2015. Retrieved 6 May 2015. ^ "[READ ORDER] Salman Khan granted interim bail by Bombay High Court in 2002 hit-and-run case". 1, Law Street. 6 May 2015. Retrieved 6 May 2015. ^ The Hindustan Times, 8 May 2015. ^ "Salman Khan: Court suspends Bollywood star's sentence". BBC News. 8 May 2015. Retrieved 8 May 2015. ^ "Read Order – Bombay High Court suspends sentence and grants bail to Salman Khan". 1, Law Street. 8 May 2015. Retrieved 8 May 2015. ^ "Salman Khan's driver Ashok Singh arrested for misleading the court in 2002 hit-and-run case". bollywoodlife.com. ^ "The tragic case of police constable Ravindra Patil who stood against Salman Khan in the 2002 hit and run case!". bollywoodlife.com. ^ "Salman Hit & Run Case: Will Ravindra Patil get justice?". dna. 7 May 2015. ^ "Underworld rules in bollywood — daily.bhaskar.com". daily.bhaskar.com. 17 September 2010. ^ Bagri, Neha Thirani (28 March 2013). "Newswallah: Bollywood and Organized Crime". ^ "Salman Khan acquitted in 2002 hit-and-run case, breaks down in court after hearing the verdict". The Times of India. 10 December 2015. Retrieved 10 December 2015. ^ Ghosh, Deepshikha (10 December 2015). "Can't Convict Salman Khan Based on Current Evidence, Says Court". NDTV. Retrieved 10 December 2015. ^ "Salman Khan Hit & Run case: Supreme court admits plea challenging his acquittal". The Hindu. Retrieved 25 February 2017. ^ "Salman in news for the wrong reasons". Tribune of India. 3 March 2002. Archived from the original on 21 November 2013. ^ Ahmed, Afsana; Sharma, Smrity (27 September 2002). "Salman harassing me, says Aishwarya". The Times of India. ^ "Police records Salman Khan's voice, Ash keeps mum". The Tribune. 18 July 2005. Archived from the original on 21 November 2013. ^ "Salman cleared in Aishwarya tape case". Dawn. 17 September 2005. Archived from the original on 10 April 2013. Retrieved 17 September 2005. ^ "No one killed the Black Bucks". hardnewsmedia.com. Retrieved 8 April 2018. ^ "The deer hunter". www.independent.co.uk. 15 November 1998. Retrieved 8 April 2018. ^ a b "Salman Khan acquitted in Arms Act case". yahoo.com. Retrieved 5 April 2018. ^ "Chinkara case: Salman Khan told to appear in person". The Times of India. 7 February 2011. Retrieved 5 February 2012. ^ "Salman granted bail on poaching case". Sify. 13 April 2006. Retrieved 28 June 2006. ^ "HC finalises charges against Salman in black buck killing case". 25 July 2012. Archived from the original on 26 July 2012. ^ "SC notice to Salman Khan in Black Buck Poaching Case". Patrika Group. 9 July 2014. Archived from the original on 13 July 2014. Retrieved 9 July 2014. ^ "Chinkara case: Rajasthan govt to approach SC against Salman's acquittal". yahoo.com. Retrieved 5 April 2018. ^ "Salman Khan acquitted of Arms Act violations in 1998 case - Times of India ►". indiatimes.com. Retrieved 5 April 2018. ^ "Salman Khan Bail Petition Jodhpur Court Start Hearing Again". Naya India. 7 April 2018. ^ "Salman Khan gets bail in Blackbuck Poaching case". 7 April 2018. ^ a b c "Salman causes uproar with Mumbai attack comment, aplologises". Retrieved 26 October 2014. ^ a b "The Economic Times – Salman Khan apologises over Mumbai attacks remark". The Economic Times. Retrieved 26 October 2014. ^ a b "Salman causes uproar with Mumbai attack comment, aplologises - Expres…". expressindia.com. 22 January 2013. Archived from the original on 22 January 2013. Retrieved 5 April 2018. ^ "Salman Khan tweets in support of Yakub Memon, asks Nawaz Sharif for Tiger's whereabouts". Firstpost. 26 July 2015. Retrieved 5 January 2016. ^ "Hang Tiger Memon, not his brother Yakub: Salman Khan on Twitter". Hindustan Times. 26 July 2015. Retrieved 5 January 2016. ^ "Salman Khan tweets Yakub Memon 'innocent', apologises after father tells him off". The Indian Express. 29 July 2015. Retrieved 5 January 2016. Ghosh, Biswadeep (2004). Hall of Fame: Salman Khan. Mumbai: Magna Books. ISBN 978-81-7809-249-2. Wikimedia Commons has media related to Salman Khan.